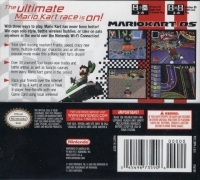 Box Text: The ultimate Mario Kart race is on! With three ways to play, Mario Kart has never been better! Win cups solo-style, battle wireless buddies, or take on pals anywhere in the world over the Nintendo Wi-Fi Connection! • Total shell-tossing mayhem! Frantic speed, crazy new items, multiple karts per character, and an all-new mission mode make this a Mario Kart fan’s dream! • Over 30 courses! 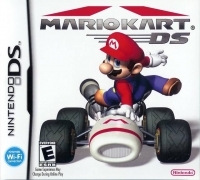 Tour brand-new tracks and battle arenas, as well as favorite courses from every Mario Kart game in the series! • Race your friends over the internet with up to 4 karts at once or have 8-player free-for-alls with one Game Card using local wireless! 01-23-2016 silverbow Box Text The ultimate Mario Kart race is on! With three ways to play, Mario Kart has never been better! Win cups solo-style, battle wireless buddies, or take on pals anywhere in the world over the Nintendo Wi-Fi Connection! • Total shell-tossing mayhem! Frantic speed, crazy new items, multiple karts per character, and an all-new mission mode make this a Mario Kart fan’s dream! • Over 30 courses! Tour brand-new tracks and battle arenas, as well as favorite courses from every Mario Kart game in the series! • Race your friends over the internet with up to 4 karts at once or have 8-player free-for-alls with one Game Card using local wireless! 09-28-2011 kaizlu Box Text With three ways to play, Mario Kart has never been better! Win cups solo-style, battle wireless buddies, or take on pals anywhere in the world over the Nintendo Wi-Fi Connection! 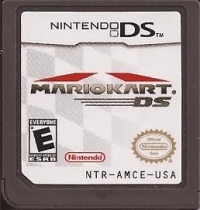 This is a list of VGCollect users who have Mario Kart DS in their Collection.